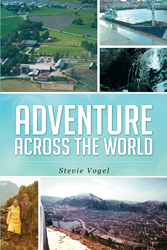 Recent release “Adventure Across The World” from Page Publishing author Stevie Vogel is an exhilarating and riveting journey that takes the reader to many foreign places. Stevie Vogel, an adventurous journalist has completed her new book “Adventure Across The World”: a tale with the allure of mysterious caves and little known fortresses awaiting on each page. Starting life as the child of two journalists, Stevie enjoyed meeting all the students from other countries at people-to-people meetings in college. A world view of people and their countries became the main interest, Stevie wanted to see the world firsthand so the merchant marine offered a chance to sail just anywhere. Published by New York City-based Page Publishing, Stevie Vogel’s captivating journey of plot twists and turns will keep the reader on the edge of their seat until the very end. The young British commander isn’t happy with his new post of Hong Kong, in 1991, until an Israeli cop appears and tells him he is after a drug cartel. Capturing drug smugglers is only the first card in the deck in "Adventure Across the World". Cmdr. Davidson’s father, thought dead, breaks cover and together they return home to discover what is happening at their family castle in Scotland. His wild sister has not been tamed by her Russian husband, Andrew. He is an old friend of the commander but has his hands full with Chloe who is pregnant. The castle is attacked but valiantly defended. The entire family is relocated to a fortress in Alesund, Norway. There is the new training headquarters for a new multination anti-terrorist force, which will use the Davidsons as the director and instructors. Chloe isn’t happy because she not only lost the castle which was hers to run, but she is going to have her baby in Norway. She is left to appreciate the many artistic offerings of the high school and the fjord horses with her American friends. Trying to form a new European and Middle Eastern force brings the old culture of the Hanseatic League where German trade with Norway built the many castle like buildings still there today. They banded together for trade and apprenticeships to create a stable fish and business environment. The sudden stormy weather thought to be a great training ground, comes into play when traitors attack. The new force gets a chance to prove its metal as a military and diplomatic force. With the birth of Chloe’s son, they feel hope for the future in "Adventure Across the World". Readers who wish to experience this riveting work can purchase “Adventure Across The World” at bookstores everywhere, or online at the Apple iTunes store, Amazon, Google Play or Barnes and Noble.